Classmunity is a web-based, end-to-end fundraising management service designed to help K-12 school districts easily, professionally and securely raise money. 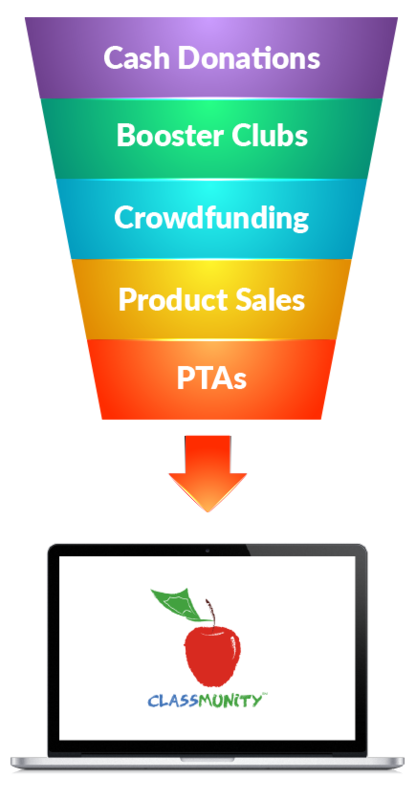 There is no software to install, and fundraising campaigns can be created in minutes. Did you know Classmunity is used in 35 WI schools? Classmunity helps schools manage more than just online fundraising! Our rewards system encourages progress and makes campaigning fun again. Easily accept cash, check and credit card donations at events such as sporting events, banquets, dances and more. Donors can easily select to make their donation automatically recur monthly, providing the district with a consistent stream of donations. With a professional website dedicated specifically for your school district, your community members can donate with ease. You no longer need to rely on verbal approvals or emails for fundraisers. Teachers can quickly and easily create campaigns, and administrators can approve at the click of a button. Conveniently track of all your fundraising from your desktop, laptop, tablet or smartphone. Student focused pages allow students take the helm and gain valuable real-world experience with video creation, social media and fundraising.